in the desk, of our girly girl's writing folder, during back to school night. Once in a while, you get the affirmation that you are doing at least one thing right. Here's to you George Lucas. You have captured the heart of a six year old girl. We have taught her well. You have done well Jedi... May the Force be with you! Your daughter is sweet you have. I guess it is better than the princesses. ;) Too cute. Super cute pic! My little loves Star Wars too, although I cannot stand those movies. Ugh...I lump it with Sci Fi, Potter, Twilight, horror...barf, kinda like your feeling with bad fonts. Course I have issues with some of those anyway...but we won't go there. mkay. Big, nerdy Star Wars fan here. I bought my 7 year old daughter a Yoda t-shirt from Target (it's Yoda wearing sunglasses, so cool) in hopes that she would love it. She does! Ha, ha! Too funny! That must have made you smile when you saw it, because I sure can't stop smiling thinking about it. So cute! My four year old loves Star Wars. Just loves it. She watches "The Empire Strikes Back" weekly. 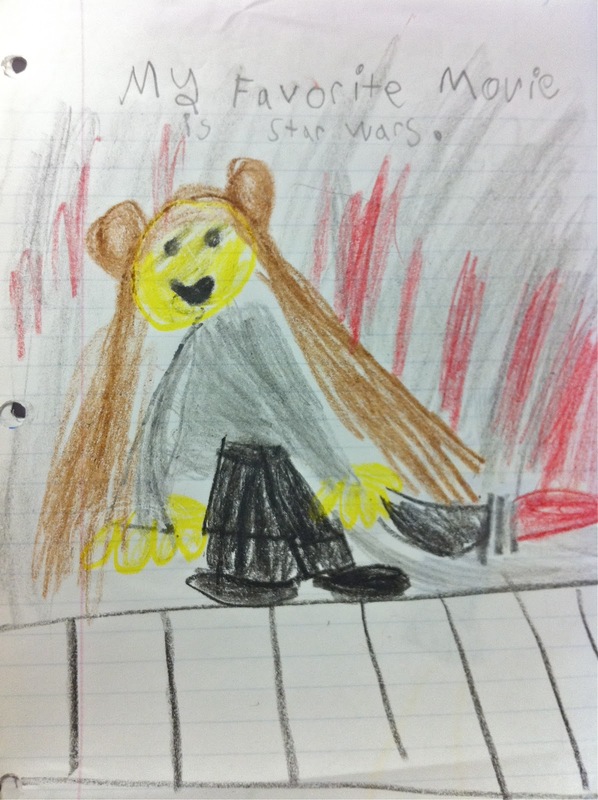 Glad to know that she is not alone in her love of all things Star Wars. oh my husband would be soooooo proud of your parenting prowess!!! I only ventured into a galaxy far far away 2 years ago (am in my 40's!!!) & mu husband to be wondered where on earth I had been for all those years!!! Have you seen this yet? Because its pure star wars awesomeness. My husband laughs at me every time, but I (completely unconsciously) always remind my daughter to be calm and patient by telling her "Have patience young Padawan learner". She's only three and hasn't really been exposed yet to the glory of Star Wars, but the day is coming soon, very soon! Well done good and faithful servant. Star Wars and Michael Jordan have reigned in our house. And Jesus too. I just stumbled onto you blog. I really enjoyed it. I was touched by your story. I just started a blog to follow our journey, so I am interested to see others.